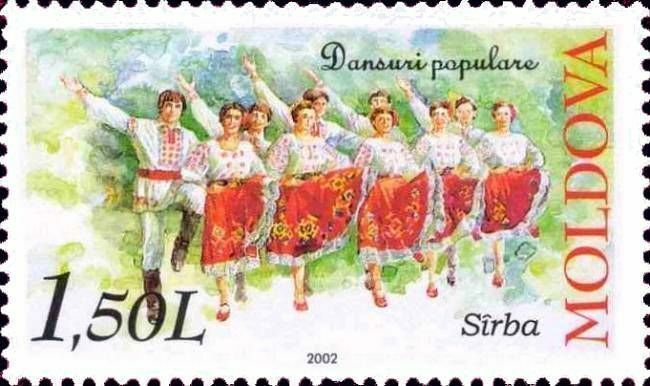 On 16 March 2002, the Post Office of Moldova (Poșta Moldovei) issued a series of postage stamps with the title Folk Dances (I). The issue comprises two stamps, with associated cancellation (postmark) and first day cover (FDC). The designer was Simion Zamşa. The printing was performed by Bundesdruckerei, Germany. Hora, also known as horo and oro, is a type of circle dance originating in the Balkans but also found in other countries. Read more.. This article uses material from the Wikipedia article 'Hora_%28dance%29', which is released under the Creative Commons Attribution-Share-Alike License 3.0. 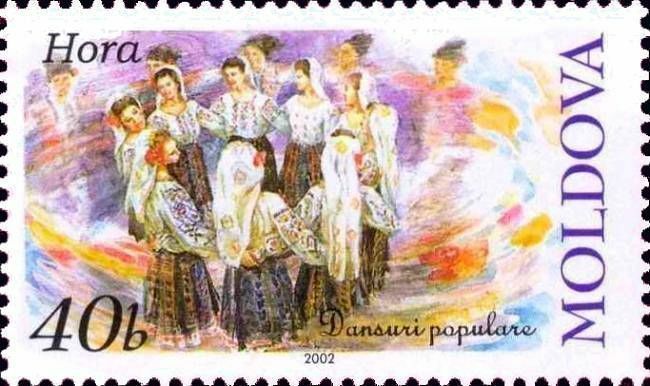 A Sârba or Sîrba in Romanian) is a Romanian and Csángó dance normally played in 2/2 or 2/4 time. It can be danced in a circle, line, or couple formations and was historically popular not only in Romania, but also Ukraine, Hungary, Polish highlanders (Gorals) and European Jewry. It is fast-paced and triplets are usually emphasized in the melody. It tends to be a happy, lively, sometimes upbeat, dance in which its name has its roots in the Romanian word sarbatoare, which translates as 'a feast-day', or used loosely as a Romanian figure of speech, usually in poetry and folk music, could also mean 'great joy' or great happiness'. Read more.. This article uses material from the Wikipedia article 'S%C3%A2rb%C4%83', which is released under the Creative Commons Attribution-Share-Alike License 3.0.